Katherine Alice Applegate has written almost 150 novels, including several popular teen series. You can read about them at K.A. Applegate‘s website. The Search for Senna: What’s going on? Best known for her bestselling pre-teen series Animorphs, K.A. 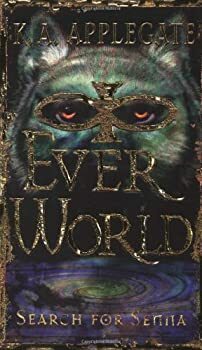 Applegate takes on a darker subject matter for a significantly older audience in her twelve book series Everworld. Straight away one of the advantages to the story is that there’s an end in sight (unlike the Animorph series which dragged on for fifty-four books), though I cannot help but wonder if perhaps this series would have benefited by simply being a single novel. The chapters are short, the font is large, and there is so little exposition presented here that it’s difficult to believe that this is an introductory novel. I must admit at being a little lost at times as to what the heck was going on. Remnants — (2001-2003) Ages 9-12. Publisher: From K.A. Applegate, best-selling author of Animorphs and Everworld, comes a dark and powerful new series that begins with the end of Earth as we know it. The end of the world. Not something most people really think about. Not something we expect to ever really happen. But what if you found out that an asteroid the size of New Jersey was about to collide with the earth? What would you do? That¹s what Jobs is asking himself. The question he asked his family. And he certainly didn¹t expect the answer he got. He didn¹t expect that in a very short time he and his family would be a few of the lucky ones selected to board a revamped space shuttle. What happens when they get to where they¹re going‹if they make it there at all? Eve and Adam — (2012) Young adult. With Michael Grant. Publisher: In the beginning, there was an apple – And then there was a car crash, a horrible injury, and a hospital. But before Evening Spiker’s head clears a strange boy named Solo is rushing her to her mother’s research facility. There, under the best care available, Eve is left alone to heal. Just when Eve thinks she will die – not from her injuries, but from boredom—her mother gives her a special project: Create the perfect boy. Using an amazingly detailed simulation, Eve starts building a boy from the ground up. Eve is creating Adam. And he will be just perfect… won’t he?